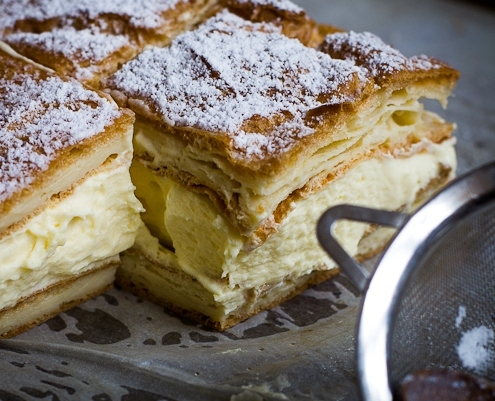 Karpatka, a Polish version of a vanilla custard slice is made with sheets of choux pastry filled with a creamy, light layer of custard cream. until the mixture comes away from the sides and forms a ball. This should only take a few seconds. Transfer dough to a mixing bowl, add eggs one at a time and beat with an electric mixer until glossy and smooth. Grease a large sheet of non-stick baking paper with extra butter. 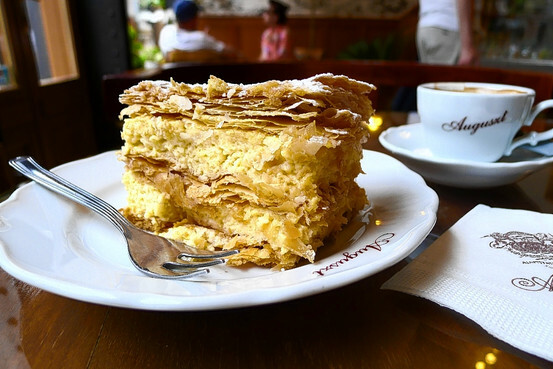 Spread pastry into a rough rectangle until the dough is only a couple of centimeters thick. Place in the oven and bake for 25 minutes. When ready, remove from the oven and allow to cool on the tray. Place cream into a mixing bowl and whip with an electric mixer until it’s fairly stiff – be careful not to overwork as it will turn into butter. Set aside. In a large saucepan, combine custard, eggs, flours and vanilla extract. Whisk until smooth. Place over low heat and cook, whisking, until the custard thickens. Cool to room temperature, whisking from time to time to prevent the skin from forming. Add whipped cream to the mixture and whisk through. Using a sharp bread knife, cut the pastry in half, the two sides will be your top and bottom. Spread custard cream over one layer, leaving a 1-inch edge around and top with another pressing down gently. Trim edges if you want to get perfect squares. Otherwise skip this step if you prefer a more rustic look. Using a sharp bread knife, cut the slice into 8 even squares. Dust with a little icing sugar and serve. Tip: store the slice in the fridge and consume within 2 days. Bring to room temperature before serving. You may need to re-dust with some icing sugar. 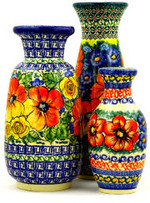 This entry was posted in Cooking with your Polish Pottery and tagged Polish Pottery Recipe, Polish recipes on July 22, 2015 by Sara.